For embedded computers systems that withstand the test of time, look no further than Global American. Global American has been the go-to provider of embedded computing solutions for industrial, government, healthcare and military use for over 30 years, and continues to innovate to this day. With our expertise, we are able to provide solutions for everything from POS kiosks and in-vehicle computers to industrial automation, medical computing, surveillance, and more. In addition to our exemplary services and products, we are also known for our outstanding customer service. We offer professional one-on-one consultations for each of our customers, and we work tirelessly to help our customers pinpoint the computer systems that will work with their exact business needs. Sometimes, these customer needs can even include computer systems that must survive extremely harsh environments—however, that’s not a problem for Global American. Our rugged line of embedded systems and boards are sealed against dust and debris and can stand up to shock, vibration and extreme temperatures. Even more importantly, we always perform a rigorous stress test to ensure each and every product is up to our professional standards; on the off chance something does go wrong, though, you can rest easy with Global American’s exceptional one-year warranty. 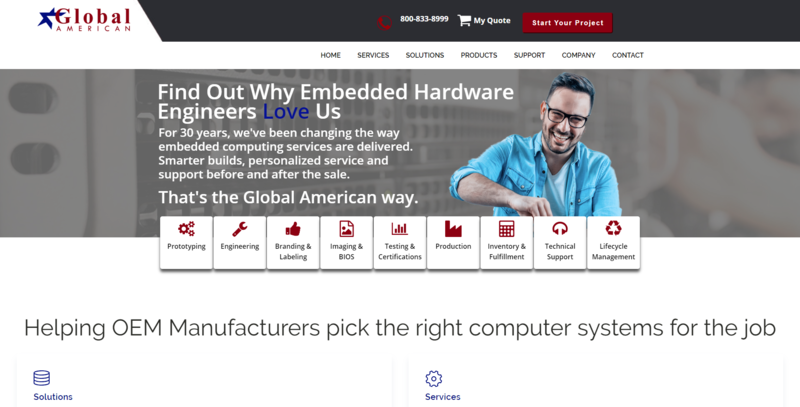 For more information on how Global American can improve your embedded computer system experience, contact us today.